This review aims to define the most appropriate surgical approach and geriatric evaluation for elderly patients with colorectal cancer (CRC). Surgery represents the main treatment for CRC, but elderly cancer patients still represent a challenge for the surgeon due to frequent comorbidities such as cardiovascular and pulmonary diseases, which increase operative risk as well as the risk of postoperative morbidity and mortality. Cancer patients with comorbidities show lower survival rates and quality of life, together with higher healthcare costs. There is also evidence that patients with comorbidities sometimes receive modified treatment, compromising optimal care. To optimize treatment, the approach to elderly cancer patients needs a multidisciplinary team to assess preoperative conditions, prevent post-surgical complications and improve outcome, especially for frail patients. Laparoscopic surgery for CRC shows a number of advantages compared to conventional surgery such as less postoperative pain, rapid return to prior activities and a decrease in costs. 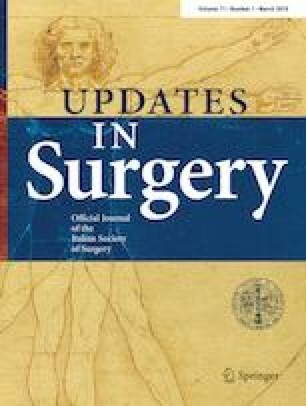 Recent studies confirm that laparoscopic procedures could be performed safely on both older and younger patients with no difference compared with open surgery as regards morbidity or length of hospital stay. We wish to thank the Scientific Bureau of the University of Catania for language support. No specific funding was obtained.